Soul Food for Hungry Adult Communities: May 5, 2013, Ascension. SOUL FOOD FOR HUNGRY ADULT COMMUNITIES: ASCENSION SUNDAY: MAY 12, 2013. Find the Mass Readings on Homepage, or click here. ‘Where the Head has gone before in glory, the Body is called to follow in hope.’ ‘We …in spirit dwell already in heavenly realms.’ (from the choice of two Opening Prayers). 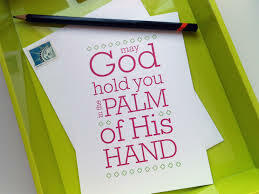 And Jesus is telling our faith communities that HE will hold us in the palms of his hands, always,- in the same palms that carry the wounds of his outpoured love. ‘Are we there yet, camel? Are we there yet?’ (from a popular ad for Bothar, the charity organisation). We are already there, yes,- but we cannot quite see it. We are already, in and with Jesus, at the right hand of the Father, – in the deepest intimacy of love with our God and Father, our Creator. ‘Are we there yet?’ Yes, we are! Jesus is saying farewell,( fare well ! ),- but he is not leaving us as orphans. ‘I am with you all days, yes, to the end of time.’ (Matthew 28). We say many farewells in life, some for a short while, some for a long time, and some permanent, at least for this life. Mothers bring their 4 or 5yr old to school, and they say farewell to one another. Young adult sons or daughters emigrate, and the farewells are very painful, yet nothing like they used to be in previous ages of travel. Later, they leave home to begin their own homes. Farewell. And then, there is the leave-taking of family or friends by the deathbed of a loved one,- if you are blessed to have the chance to say your farewells. Life is full of those letting go’s, as we move on to new phases. And the twelve apostles let Jesus go, also. ‘As he blessed them, he withdrew from them and was carried up to heaven.’ And what did they do? ‘They worshipped him, and then went back to Jerusalem full of joy; they were continually in the Temple praising God. Why? Because he had promised them: ‘I am with you all days, yes, to the end of time.’ And also, ‘When two or more of you are gathered in my name, there I am in the middle of you.’ That’s the promise of his continued presence. The Son is at the right hand of the Father, -and so are we, with him, one body with him. We are already there, in reality. And the Son of God, the Son of Mary, the Risen LORD, is still with us, the whole time,- in our communities, in our families, in each of our hearts, and in our whole world. He is there, and he is here! ‘Goodbye’ is from the old English ‘God be wi’ ye!’ What a nice blessing as we take leave of one another,- God be with you! Are we there yet? Yes, we are. As God’s people, as the Spouse of Christ, as the Body of the Lord, we are with him already, in the heart of the Father. Can we show it on our faces? Are you ‘full of joy‘ like the twelve, after he left them? Share this with your community,- whether of two people, three, or many. Show the radiance on the face of Christ, in you. ‘…but you, not many days from now, will be baptised with the Holy Spirit’. Alleluia: ‘I am with you always, yes, to the end of time.’ Mt.28. ← Soul Food for Young Adult Communities: Ascension Sunday, May 5, ’13.